The game starts as your character awakens from suspended animation after 214 years. He is aboard a space station that is in a decaying orbit around the planet Sarpedon. He has no memory of who he is or how he got there. A holographic projection informs your character that his name is Sen Geder and that he is a great traitor who almost single-handedly caused the war that has all but destroyed his people. Only a single valley remains of what was once a great unified planetwide civilization. The space station's orbit is deteriorating and it will fall from orbit in a matter of days. The first half of Sen's punishment for his crimes is that he will be onboard the ill-fated station. The second half is that... But at that moment a bolt of electricity strikes the hologram projector and Sen is left alone and bewildered, to sort out the mystery for himself. Needless to say, with the player's help Sen does manage to get off the space station. He sets out to unravel the mystery of who he is and what really happened on Sarpedon. Sen is aided in his quest by computer-like machine beings known as Companions. They provide Sen with "chameleon technology" so that he can interact with the people of Sarpedon without his true identity being detected. Although they are primarily benevolent entities, Companions hold secrets and it is not until the end of the game that Sen learns their true nature. In the course of his journey Sen meets the people from the different factions in the war. The Transai are the technology-oriented people who strive to maintain the old and failing technological achievements of the past. The Ansala are the nature-oriented people who have mysterious mental powers. Mysterious Journey 2 is not a continuation of the first Mysterious Journey game. But it was created by the same people who made the first game, and you can see the similarity in the design of the gameworld. The distinctive Gelleas ships that were first seen in the original Mysterious Journey make a reappearance here. But the story and gameworld are unrelated. Unlike the first game, Mysterious Journey 2 uses a 3D game engine. The result is that the graphics aren't as detailed and beautiful as in the first game (at least not as detailed as in the DVD version). And Mysterious Journey 2 requires a computer with much higher system specs in order to play it. However Mysterious Journey 2 offers a freedom of movement that was lacking in the previous game. You are allowed to move pretty much where you please, though in some areas you are confined to walkways. The game prevents you from falling off ledges accidentally, and you may not be able to venture outside some boundaries. But for the most part you have all the benefits of a fully 3D game engine. Mysterious Journey 2 does a complete install to the hard drive from 3 CD's. Once installed, you can put away your CD's. You do not need a CD in the drive to start or play the game. Mysterious Journey 2 has a very well designed interface for its 3D engine. You can steer and move around using either the keyboard or the mouse or a combination of both. It isn't point-and-click, but it's about as easy as a 3D engine can get. To move using the mouse, you hold down the right mouse button to go forward and move the mouse left or right to steer. To move using the keyboard, you use W to move forward, S to move backward, and the A and D keys to sidestep left or right. The arrow keys can be used to look up or down or turn left or right. You can also look up or down by moving the mouse. These are the default controls. There is a "Redefine Controls" option in the Settings Menu that allows you to remap the default keys for movement. Using the Escape key during the game will bring up the In-Game Menu from which you can save or load a game, adjust the settings, or read a transcript of what was said during cut scenes. The game has no option for subtitles within the menu, but most of what is said is clear and you can always refer to the transcript if you miss something. Using the F5 key during gameplay will bring up the save game screen. It's the same one you get by using Escape and then Save Game, just a little faster to access. You are allowed to type in a name for the save. Also, the game will autosave for you periodically in case you forget. You can move up or down through the Transcript and the Load Game windows either by clicking your mouse on a small arrow at the right side of the window or by using the Page Up and Page Down keys. The spacebar can be used to make you "hop." This doesn't seem to be mentioned in the game manual, though it's listed in the Redefine Controls menu as "Jump." I call it "hop" because it's such a tiny little jump. Sometimes "hop" is useful for getting over a doorsill. But usually I had better luck moving side to side or backing up and trying from a different angle if Sen got stuck on stairs or a stone in the path. It isn't necessary to use "hop," and I played through the whole game without realizing it existed. The default cursor is a small circle that shows up in the center of the screen. To assist you in finding objects in the 3D environment, small arrows will appear around the default cursor, pointing in the direction of items of interest. When you get close enough to a collectible object or a puzzle you can interact with, you see the letters USE appear near the cursor. Clicking on USE allows you to access a puzzle, communicate with a Companion, or collect or use an inventory item. You can back out of a USE screen with the right mouse button. There is also a "Warp" cursor that appears when you're about to go into a new area. It looks like a bunch of nested circles that are connected on the bottom. If you want to further explore the game area you're currently in before proceeding with the game (and waiting through a load screen), the appearance of the "Warp" cursor gives you a warning so you can back away or turn around. Game options are accessible through the Main Menu and the In-Game Menu. Mysterious Journey 2 plays in 32-bit color (true color) in your choice of 640x480, 800x600, 960x720, 1024x768, 1152x864, and 1600x1200. You also get a choice of Low or High detail. There are controls for Gamma, Sound Volume, Music On or Off, Walk Speed, and Mouse Sensitivity. You can also invert the mouse control and remap the keyboard keys for forward, backward, sidestep, jump, and action. The Walk Speed and Mouse Sensitivity controls should be especially useful for those who, like myself, tend to get motion sickness in first person 3D games. You don't have to move fast in this game unless you want to. I reduced Mouse Sensitivity all the way, but found the default Walk Speed to be slow enough not to cause me problems. The puzzles in Mysterious Journey 2 were generally easier than in the previous game. There wasn't any having to trek from one side of the gameworld to the other just to get information or change a control somewhere. Most puzzles are located in discrete areas and you solve them by searching for clues in the area around you or by experimenting with puzzle controls and observing the result. There are a lot of door puzzles and bridge puzzles. The bridge puzzles aren't anything like the notorious bridge puzzle in the first Mysterious Journey game though. As long as you don't get hung up on questions like "why in heck would someone use THAT for a bridge?" the bridge puzzles are not impossibly difficult. Most of the puzzles in Mysterious Journey are logic-based. There are two or three puzzles that involve being able to add numbers in base 4 and base 12 numbering systems. One puzzle seemed at first to be a timed puzzle with a very tight limit on your time. In fact it turned out to be the order that you did things that was important, not your speed. It only "looked" like you weren't fast enough. There are no sliders. There was one sound-based puzzle, but the sounds weren't garbled. This was no repeat of the notorious priest and spinning prayer wheel puzzle from the first Mysterious Journey. The puzzles don't really increase in difficulty as you go along. One of the puzzles I had the most problems with was very early in the game - a puzzle that involved directing laser beams toward... well... I don't want to give too much away. Although they are generally easier than in the first Mysterious Journey game, some of the puzzles are still quite challenging. The tower puzzle took me a LONG time. My vote for the most annoying puzzle in the game was a puzzle involving a labyrinthine path that was hidden beneath fog. The main difficulty with this puzzle was not so much figuring out what to do as doing it. It was very tedious to inch my way along, step by step, so as not to fall through the path. This was the only puzzle I skipped when I replayed the game. Fortunately there were no others like it. Some puzzles can be solved by more than one approach. But the game is fairly linear. So if you get stuck on a puzzle, you won't be able to progress very far in the game until it's solved. Inventory is pretty much automatic. You collect inventory items by clicking on them or having someone give them to you. When you get near something you can use an inventory item on, the inventory bar appears at the bottom of the screen and a USE option appears near the place you need to use it. Inventory does not accumulate and I don't think I ever had more than 3 inventory items at once. There aren't really any inventory-based puzzles. If you need to use something on something else, the inventory bar appears at the bottom of the screen when you approach the thing you need to use the item on. The graphics are among the most beautiful graphics I've ever seen in a game with a 3D engine. The same inventive imaginations that created the strange and beautiful gameworld of the first Mysterious Journey have translated many of their ideas to 3D. The images of Brada Coe at night, with its huge luminous flowers, are some of the most beautiful I've seen in a game. Graphics in the interactive part of the game are full screen. Cut scenes are widescreen format, with black areas above and below the image. 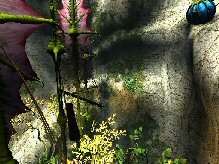 There are many animations in the game: birds flying, trees blowing in the wind, fireflies swarming, windmills turning, snow sifting down through a hole in the roof, and various types of water movement. There were other types of animations as well. Sarpedon seemed very much alive. Even on the space station, you could look out the window and see lights on the hull turning on and off. The music in Mysterious Journey 2 is similar to what I've heard described as "space music." It's mood music rather than something hummable and it has a sci-fi feel to it. After a few minutes, the music changes to another selection regardless of your location. Sound effects and background sounds were very good. Sometimes I'd turn off the music while I played, listening to the background sounds instead. Voice acting was mostly good to very good. There was one exception toward the end of the game which came as a bit of a shock after the quality of the previous voices. In my opinion Mysterious Journey 2 had much better plot exposition than the previous Mysterious Journey game. There were no conversations where you'd choose what to say from a list. Instead there were fairly frequent cut scenes which moved the plot along nicely. The cut scenes use the game's own 3D engine rather than being prerendered. So how well they play will depend on your processor and video card. On my computer there were a few artifacts, such as characters sometimes disappearing just before the end of a cut scene. In some scenes where an airship was flying, my video card would start to choke and I'd see the airship chug along instead of gliding gracefully to rest. I was a little disappointed in the ending. I thought it seemed rushed. After the sometimes lengthy cut scenes I'd previously encountered, I expected more exposition at the end. I would have liked to see more of what happened to Sen immediately after I solved the final puzzle. I suggest you play this game from a partition with plenty of hard drive space. Not only does the game take a full install, but the saved games aren't tiny and can eat up a lot of space. The game doesn't give you the option of "saving over" previous saves and I ended up with over 100 MB worth of saved games by the time I'd finished. Mysterious Journey 2 never crashed on my computer. But I did have a problem with the final puzzle, which essentially made it unsolvable without a walkthrough or hints (or by more trial and error than I have patience for). Near the end of the game, there are four towers you can walk out on. You're supposed to see numbers on top of them. I only saw part of one of the numbers. The other towers were stark white on top with no marks at all. I tried turning the gamma all the way down. But although this totally obscured the openings along the walls of the room, the tops of the towers remained stark white (except for that part of a number on the first tower). Apparently some people have this problem and others don't. I hope it will eventually be fixed with a patch, or some other solution found. The most common problems with the game seem to be from trying to play it on a computer that does not meet the recommended specs. You absolutely need a video card that is capable of hardware T&L and that has at least 64 MB of video RAM. An onboard video card that uses shared memory will simply not work. According to one of the techs at the Dreamcatcher/TAC forum, the game won't even install if you are using an onboard card. I played Mysterious Journey on a computer that was above minimum specs, but below the recommended spec for the processor (1.2 GHz instead of 1.6 GHz). I played the game at 1024x768 resolution with High Detail because the game played smoothly most of the time at these settings. But movement was sluggish in a few areas, especially those with large amounts of water movement or with a lot of other animations going on. Changing resolution to 640x480 helped slightly, but not enough to make much difference. I've already mentioned the problem I had with characters disappearing toward the end of cut scenes. I also occasionally had the characters freeze for a second in the middle of a cut scene and some cut scenes seeming to have the end of them clipped off. Since I don't have a computer with the recommended specs to test on, I can't tell how much these artifacts are the fault of my computer and how much the fault of the game's video rendering engine. But these problems certainly could be caused by having a slightly underpowered computer and video card. Load times varied in length from 15 to 52 seconds with an average around 30 seconds. I assume computers with faster processors would have shorter load times and those with slower processors would have longer load times. Fortunately this isn't a game where you die all the time. In fact you don't die at all. But you still have load times before cut scenes and when you move to another part of the game through a "warp." I'd recommend this game to almost any adventure gamer who enjoys first person adventure games, as long as their computer is up to the task. The cut scenes were frequent enough to keep the plot moving along, so it's possible that even those who don't like "solitary" games won't feel so alone in this one. However there are no conversation-based puzzles or complex inventory puzzles. So if these are your favorites, you'll be missing them. I enjoyed the puzzles and roaming around the gameworld, and the story was interesting enough to keep me playing late into the night. It was also refreshing to play an adventure game that relied entirely on mental challenges instead of injecting physical ones. It was a great game to relax with in the evening and I hope to see a Mysterious Journey 3 some time in the not too distant future.